Buy a large box of sea salt to make this simple concoction, which can be used to scent a room or to infuse your bath with your choice of fragrance. In a zipper bag mix together approximately four cups of sea salts with your choice of soap dye or food coloring. Begin with about six drops of dye and add more colour if necessary. To mix the colour with the salt, gently move the salt within the closed bag. Don’t shake or rub harshly as this will break away some of the salt and create smaller salt grains. Once you have reached the desired color, you can add a few drops of glycerin. Mix as before to blend the glycerin. Glycerin makes the salt shine a little, so if you prefer the matt finish, don’t add glycerin. Pour the bath salts into a glass container or parchment lined container and spread out evenly. Let the bath salts dry out for a day or so, although the drying time will vary. When the salts mixture is completely dry, return it to a zipper plastic bag and add fragrance oil or essential oil. The amount needed will depend upon how strong you want the scent, so experiment a little to get the perfect recipe for you. Essential oils tend to be a little harsher or stronger than fragrance oils, but the scent lasts longer. As always, if you have a sensitivity to any ingredients in bath salts or bath recipes, you should amend the recipe for your needs or consult your doctor before use. After adding essential oil or fragrance oil, return the salts to a zipper bag, seal tightly and let stand again for several days. This will allow the oil to penetrate properly for long-lasting scent. sing in the bath as it’s great for your skin. 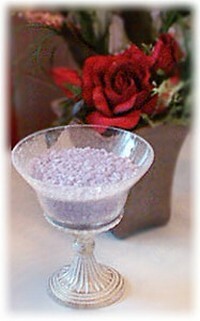 To use as air freshener or potpourri, simply display the scented bath salts in an open container.